Oversize 32 oz personalized Christmas stadium cups are the big gulps of party cups. 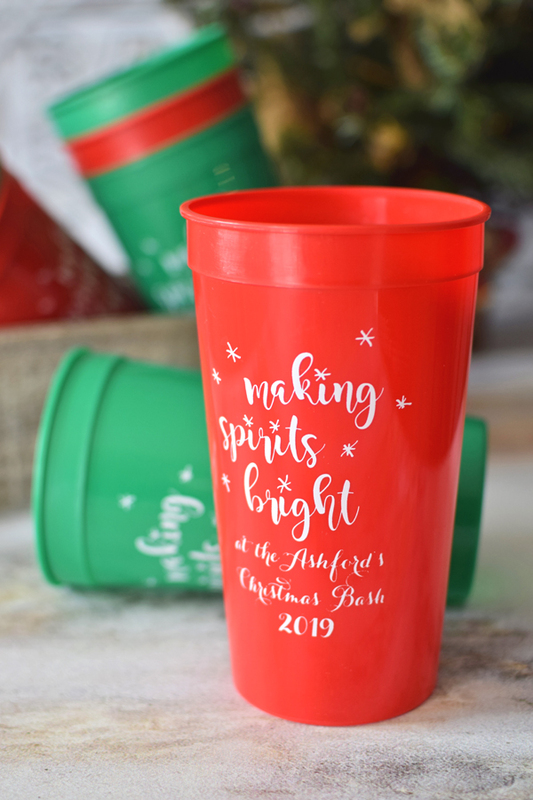 Personalized with the festive holiday design of your choice and up to three lines of custom text, these jumbo cups are dishwasher-safe and reusable, making the ultimate holiday party favors. Add some holiday popcorn and goodies in the cup and hand out at your company party for a unique thank you gift idea. We accept company logos for printing. Call us at 844-847-8623 for more details. 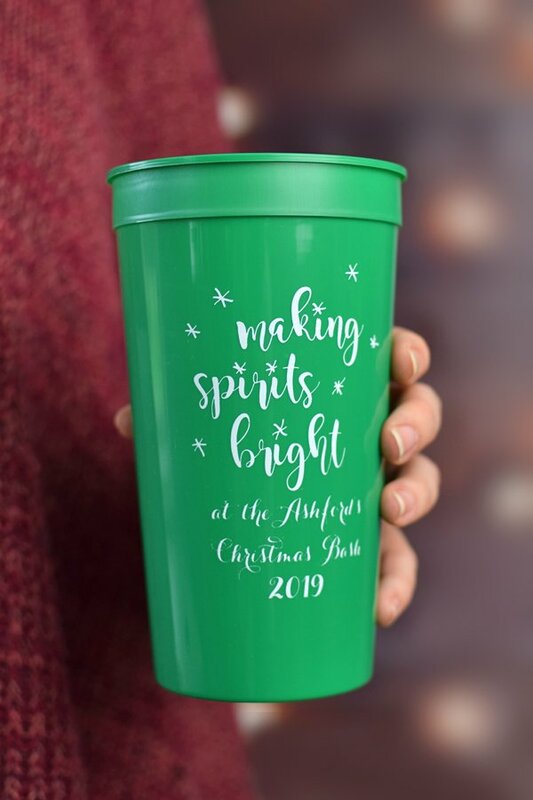 To order two different cups colors, simply enter your request in the special instructions box below (We require a minimum of 25 cups per color request). Add FREE Back Sided Printing? Loved our cups, they were a big hit at our Ugly Sweater party.. well made & worth every penny! I bought these cups for our "Ugly Christmas Sweater" party. Didn't take very long to arrive. They look great! I love everything about them except one thing...they smell. I have washed them twice but when I stack them back up, they smell like moth balls. I'm assuming it's from the ink that was used in printing. I'm still using them because I think they're great. I will just have wash/rinse each one before someone makes a drink. The Cups turned out fantastic! We look forward to seeing them in use at our Company Christmas party. Thank you!! We ordered these cups for our employees. Everything from the product itself to shipment of the product was great. Customer Service even called after we ordered the product to review the order. The shipment arrived exactly on the day they said it would. I would def. purchase from Tippy Toad again. Here at TippyToad, we pride ourselves in offering quality, custom printed party supplies for the Pinterest savvy planner looking to complete their party planning vision. From custom printed cups and napkins to personalized gifts for any occasion, let us help bring a custom, one-of-a-kind touch to your event. TippyToad offers a wide range of party decorations and ideas. Choose from baby shower favors, birthday party decorations, graduation party supplies, Christmas gifts, and much more. Need Help? Call us toll-free today at 1-844-847-8623 for assistance. Office hours are Mon-Fri 8-5 EST. copied or reproduced in any manner without express permission. All Rights Reserved.